How we can deal with your social media accounts and promote you and your website. The thing about modern social media is that there is just so much of it available. A question I am often asked is how and where do you begin with social media. Once you start down along the path of getting engaged with your public using social media, you rapidly start building accounts in all kinds of services. You might start say with a standard facebook account, decide that you want to give twitter a try, add in a linked-in account to keep in touch with business contacts, put your photos up on tumblr or one of the myriad of other hosting sites, then of course google went and added iGoogle, google reader and then added google+ as its social networking site. All of a sudden you are dabbling in a crazy number of different sites and places every day but the more that you do, the more that you feel that if you don’t then you are definitely missing out on market potential. When you get us to design a website for you, we can build in access to as many of these social media accounts as you wish, to make it as painless as possible to tell the world about your latest offer or item for sale, your new line in garments, The new account or project that you have won. We can automatically link in newly created pages or even blog posts using your social media accounts without you having to lift a finger. 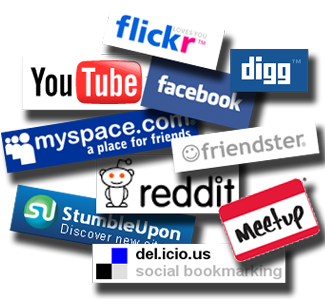 We can lead you through the process of maintaining your social network presences or do it for you if you wish. The social media suppliers API interfaces (Automatic programming interfaces) allow things to be done quite easily nowadays (once you know what you are at, and become good at it). A new website has upped the ante quite a bit in this regard. Called “if this then that” (www.ifttt.com), it can create what is known as “mash-ups” quite easily between a multitude of different services. You can for example, send an email to yourself when a particular weather service says it is due to rain, or automatically save a photo that you have been tagged on facebook in to your flickr account, log your favourite feeds and save them in an easily stored format, create an online diary of your facebook pages or tweets. The possibilities are endless and it is achieved by creating what they call “recipes” to do this automatically (if this happens then do that). Every time you log on to the site users have added more and more of these “Recipes” that you can download or if you want then we can very easily create one for you at our end to look after the dirty work. The possible uses of this are limitless, why not give us a call to discuss what you come up with and let us come up with the way to do it. Opulus Sombre Theme | Powered by WordPress, Installed by Installatron.